MARCH 1999 -- Robin Palley, a long-time friend of Sheehan World publisher Kathy Sheehan, has left her job at phillynews.com to become the director of business development at healtheon.com in the Silicon Valley. Flying without a net, the normally risk-averse Palley gave up her secure union editing job in Philadelphia to head up a new venture in the rapidly growing health industry. Palley, a fellow Virgo, had several lucrative offers in online publishing, including one from bimbo.com, but chose to become a Valley girl instead. 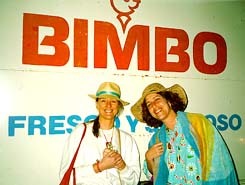 Palley (right) and Sheehan interviewed for jobs that paid a lot of dough at the Bimbo Tortilla Co. while vacationing on Isla Mujeres, off the coast of Cancun, Mexico, several years ago. On her first day on the job at healtheon.com, Palley managed time to be a virtual guest on WWU's journalism department WebBoard. She and phillyonline sports editor Jodi Leese talked about careers in new media with journalism students at WWU Feb. 22. Those students created web pages as their course-long project. Check them out on the WWU Journalism Department server. A different group of journalism students produced a wonderful set of profiles in the beginning newswriting class that ended in mid March. Nearly all 14 profiles are eminently publishable. Read about 8-year-old Lenartha Christian who stands taller than most people thrice his age; a woman who survived her brother's electric chair to become a trainer of rescue workers; WWU's fastpitch MVP; the new chef manager at the Viking Union; and more! Congratulations to Siobhan Millhouse, Peter Neorr, Andy Faubion and Linnea Westerlind from the latter group. They wrote some outstanding ledes during the quarter and earned certificates pronouncing them professional lede writers!